Your online Square Dashboard gives you access to the tools you need to manage your daily business operations. See how your business is doing with advanced reporting tools, manage timecards and employees, and create marketing campaigns that help you stay in touch with customers – all in one place. 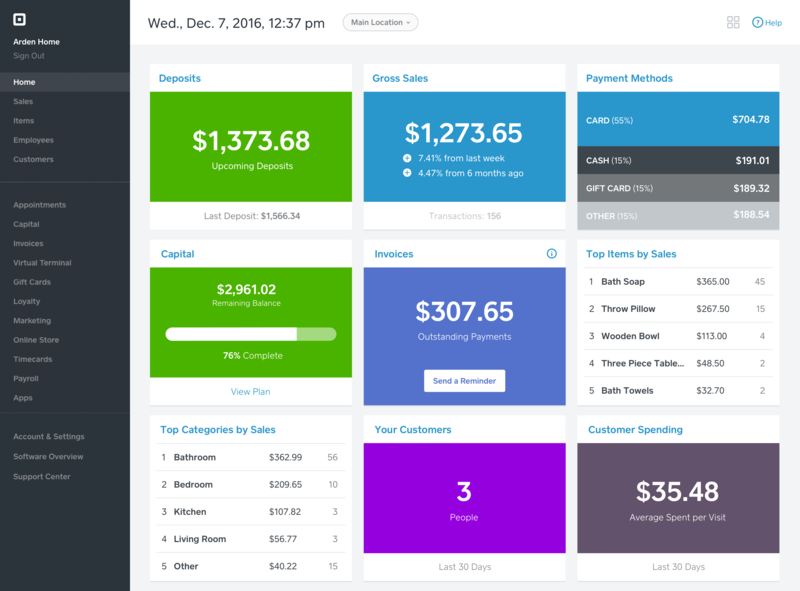 Home provides a snapshot of your daily business activities – your next deposit amount, top selling items, feedback from your customers, and more. The widgets in your Home tab can be reordered via drag-and-drop or removed by clicking on the grid icon in the upper-right corner. Reports: Access general sales summaries and fees paid, create custom reports, and view reports on sales trends, accepted payment methods, items sold, etc. Deposits: See your next deposit amount, full deposit history, and a breakdown of the transactions included in each deposit. You can also adjust your close of day. Item Library: Items help speed up payments, manage pricing and taxes, and track inventory. Modifiers: Create a set of options that can be applied to an Item to speed up check out. Categories: Organize Items into categories for faster access and useful reporting. Discounts: Create and manage discounts that can be applied to a sale. Taxes: Set up and manage applicable taxes for your sales. Dining Options: Create dining options which will be applied to kitchen tickets, receipts, and reports. Create permission groups and employees, then track shifts and timecards by Employee. Manage your entire staff in a few clicks, allowing your team to take payments while keeping dashboard access secure. Permissions: Create predefined roles for current and future employees that set permissions for what they can access in your Square app and dashboard. Employee List: Create employee profiles with assigned roles and passcodes for your Square app and dashboard. Access tools to help you to better manage, understand, and engage with your customers. Simple online scheduling, calendar management, and payment acceptance for services booked online are available with Square Appointments. Head to Appointments to try it free for 30 days. Overview: View upcoming appointments and notifications for services booked online. Calendar: Manage your calendar, create appointments, and set custom availability for online booking. Online Booking: Edit and view your Online Booking Site, create embeddable widgets for your website, invite clients to book online, and set a custom display order for services booked online. Services: Create, price, and assign services to staff members. Staff: Create Staff profiles and set access permissions and hours for employees. Clients: Add and edit client profiles with contact information, notes, and communication preferences. Settings: Manage online booking and calendar preferences, set up online prepayments and No-Show protection, and edit client communications. Square Capital gives you funds to grow your business, repay your loan with a fixed percentage of your daily card sales. Manage everything invoice related – create new invoices, see outstanding or unpaid invoices, review your invoice payment history, and more. Learn more about using Virtual Terminal in our Support Center. Allow your customers opt in to your loyalty program at checkout simply by entering their phone number to earn stars and rewards automatically. Send your customers personalized marketing emails, automated campaigns, and promotions with our email tool and distribution list. From Online Store, set up your free store to sell goods, services, event tickets, and even accept donations. Manage and edit your employee’s hours right from your Square Dashboard. Activity: View, create, and edit individual timecards. Report: View timecard reports by employee. Settings: Set Overtime rules for each location and select a Work Period. Square’s online payroll services have you covered for tax filings, sick leave, workers’ comp, and more. Square Payroll imports your employee’s timecards from the Square app, calculates overtime, and handles taxes so you can pay your team faster. Square seamlessly syncs with apps that help you manage everything from accounting and taxes, to inventory, eCommerce, shipping, and restaurant management. Account & Settings is where you can manage your personal account information, business information, and place an order for Square hardware and marketing material. Personal Information: Manage your account email address and enable security features that prevent unauthorized access. Bank Accounts: Manage bank accounts across locations. Email Notifications: Tell us what emails you’d like to receive from Square and add more recipients. Get Free Processing: Your invite link gets you free processing when someone uses it to sign up for Square. Locations: Create and manage multiple locations for your business. Set bank details, hours, device codes, and more. Pricing & Subscriptions: View and manage your subscription services, view monthly bills, and update your preferred payment method. Deposits: Set a custom daily deposit schedule so you can get your money when you need it. Receipt: View and manage your receipt appearance, public information, return policy, and more. Tax Forms: Update your taxpayer information and view 1099-K Forms. Devices: Set up device codes that sign you into the Square app instead of your email and password. Card Reader: Request a free magstripe reader or order a chip card and Apple Pay reader. Sticker Sheet: Let your customers know you accept credit cards with Square. Order a Stand: The Square Stand gives you a complete POS solution minus the clutter. Order Status: View your hardware order history and status.